For the film often subtitled "Turtles in Time", see Teenage Mutant Ninja Turtles III. Teenage Mutant Ninja Turtles: Turtles in Time, released as Teenage Mutant Hero Turtles: Turtles in Time in Europe, is an arcade video game produced by Konami. A sequel to the original Teenage Mutant Ninja Turtles (TMNT) arcade game, it is a scrolling beat 'em up type game based mainly on the 1987 TMNT animated series. 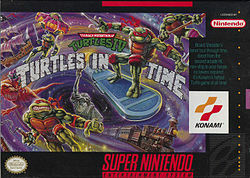 Originally an arcade game, Turtles in Time was ported to the Super Nintendo Entertainment System in 1992, whereupon it was retitled to serve as a sequel to Teenage Mutant Ninja Turtles III: The Manhattan Project. That same year, a game that borrowed many elements, Teenage Mutant Ninja Turtles: The Hyperstone Heist was released for the Mega Drive/Sega Genesis. 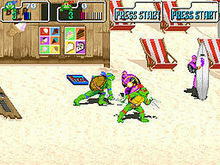 Years later, the arcade version of Turtles in Time was revisited on newer consoles. A slightly altered version of the arcade game was included as an unlockable bonus in the 2005 game Teenage Mutant Ninja Turtles 3: Mutant Nightmare. On 5 August 2009, Ubisoft released a 3D remake of the game, Teenage Mutant Ninja Turtles: Turtles in Time Re-Shelled, for Xbox Live Arcade. The remake was released onto PlayStation Network on September 10, 2009. Up to four players (two players in the Super Famicom/SNES version) can take control of Leonardo, Michaelangelo, Donatello, and Raphael. Each playable character has his own strengths and weaknesses. New features in this game include the ability to execute a power attack by hitting an enemy several times in a row, and the ability to slam Foot Soldiers into surrounding enemies. The game features the same control scheme of the previous arcade release—a joystick for movement, an attack button and a jump button. Certain joystick/button combinations can make a Turtle run, perform a slide or dash attack, jump higher, perform a stationary or directed air attack, or perform a special attack. Players guide the turtles through a series of levels, starting out in the streets of New York City before being transported to levels representing various eras of history. In each level, players face enemies from both the 1987 cartoon and the feature film Teenage Mutant Ninja Turtles II: The Secret of the Ooze, including foot soldiers, stone warriors and Tokka and Rahzar as end-of-level bosses. The introductory cut scene of the game details the game's plot. It begins with the Turtles watching a TV newscast on a Sunday evening, with April O'Neil reporting from Liberty Island. Suddenly, Krang flies in using a giant exosuit (seen occasionally in the animated series) and steals the Statue of Liberty, moments before Shredder hijacks the airwaves to laugh at the Turtles. The Turtles jump into action in downtown New York and pursue the Foot to the streets and the city sewers (then to the Technodrome in the SNES version), where Shredder sends them through a time warp. The Turtles must fight Shredder's army in both the past and the future in order to get home. The original music of the game's soundtrack was composed by Mutsuhiko Izumi, a TMNT veteran who also composed the music for the previous arcade game in the series. It was arranged for the Super Famicom/SNES version by Kazuhiko Uehara and Harumi Ueko, both of whom went on to produce several Konami games, including the following TMNT game, Tournament Fighters. In addition to an original musical score, the attract mode of the arcade game is noted for featuring the song "Pizza Power", which was taken from the TMNT live concert known as the Coming Out of Their Shells Tour. The game's music was released as part of the compilation album Konami All-Stars 1993 ~ Music Station of Dreams, published by King Records in 1992. The 2005 version of the game included in Mutant Nightmare features new music and voices, updated to match the new TMNT series. The same would apply to Turtles In Time: Re-Shelled. While the Japanese Super Famicom version retained the original arcade title, the SNES version was retitled Teenage Mutant Ninja Turtles IV: Turtles in Time in North America, Australia and Teenage Mutant Hero Turtles IV: Turtles in Time in Europe in order to tie it to the first three Ninja Turtles games for the NES, although the third NES game was never released in Europe. Like the Famicom/NES version of the first arcade game, the Super Famicom/SNES version of Turtles in Time is not a direct port of the arcade original, as it did present some notable differences in presentation and gameplay. While the SNES version is missing some animations and graphics effects from the arcade version, it made extensive use of the SNES's Mode 7 forward scrolling effect, in the "Neon Night-Riders" level, the option to give unique skin tones for each turtle and most memorably in rendering the throw move which involved foot soldiers being thrown directly at, and hitting, the screen. The first fight with Shredder in the Technodrome level was altered to show off the Mode 7 effect by having the player aim to hit a foreground Shredder with the throw move. The SNES version is also missing certain voice samples for both the turtles and boss characters. In addition, the arcade version's title theme song, "Pizza Power", was replaced with an instrumental version of the cartoon theme song. Various alterations were made to the SNES version's gameplay. While the original arcade game was set in the year 1991, the SNES version opens a year later, in 1992. "Sewer Surfin'" and "Neon Night-Riders" were changed to bonus levels and a new Technodrome stage was added. Five new bosses were also added: Slash (who replaced Cement Man), the Rat King, Battletank Shredder, and the duo of Bebop and Rocksteady (who replaced Tokka and Rahzar, with those two moved to the new Technodrome level). The game also replaces the final boss with Super Shredder from Teenage Mutant Ninja Turtles II: The Secret of the Ooze (who previously appeared in the NES game Teenage Mutant Ninja Turtles III: The Manhattan Project). The SNES version also adds two regular enemies: Roadkill Rodneys (which replaced the boxing robots) and Mousers. The game also features a time-trial mode and a two-player versus fight mode. 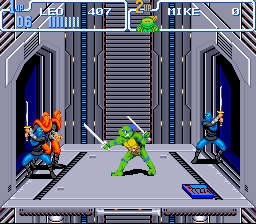 Like the arcade version, each turtle was given unique attributes in areas such as speed and strength. In addition, the move to throw enemies off-screen can now be performed intentionally (instead of just randomly), a technique specifically required at the end of the Technodrome level. The original arcade version could be unlocked after completing the first batch of missions in Teenage Mutant Ninja Turtles 3: Mutant Nightmare. The game is mostly the same as the arcade, but it lacks a score counter, features an entirely new soundtrack (likely due to rights issues with the original soundtrack), features re-recorded voices, and has a slightly choppy frame rate compared to the arcade. Additionally, this version requires the controller to be inserted into a particular slot to play as each character. This means that if one plays the game on a PS2 without a multitap, it is not possible to play as Donatello or Raphael, as the default PS2 only features two controller slots. The new soundtrack is a re-arranged version from the NDS version of Mutant Nightmare. Following its release, Turtles in Time became Konami's best selling arcade title. Although critics found that the second game was largely similar to the previous arcade game, they felt that it was a net improvement over its predecessor on all points, including graphics, music and gameplay. Overall, the game was hailed for staying true to its source material. The SNES version was praised for its additional stages and gameplay modes. Like the arcade version, the SNES game has been lauded for its visuals, which replicate the cartoon's art style. The game's music and sound effects have also been praised. However, the game has been criticized for its repetitive gameplay and short length. Despite these criticisms, Nintendojo called Teenage Mutant Ninja Turtles IV: Turtles in Time the best Ninja Turtles game of all time, while ScrewAttack called it the best Beat Em' Up ever. Following his Performance of the Night award-winning bout at UFC 173, fighter and Super Nintendo fan Mitch Clarke told reporters Turtles in Time is his favourite SNES game. The 2009 remake, Teenage Mutant Ninja Turtles: Turtles in Time Re-Shelled, features new graphics and sounds. The graphics were remade completely in 3D, with players now moving in and out of a true 3D camera. The opening and closing cinematics were remade with a stylized 2D look. The vocal quips of the arcade version return, re-recorded by the cast of the 2003 cartoon. The music has also been re-done for every stage. Re-Shelled is based on the original arcade machine rather than the SNES version, meaning that the extra stages and enemy characters from the earlier home version are excluded. The gameplay remains similar, except that players can now attack in eight directions. The game can also be played online with up to four players. This version also features a Survival mode, Quickplay mode, multiple difficulties and Achievements/Trophy support. ^ GameSpot review of Teenage Mutant Ninja Turtles 3: Mutant Nightmare. URL retrieved 16 September 2006. ^ Bailey, Kat (2009-06-11). "Turtles In Time Remake To Be A Timed Exclusive". 1UP.com. Retrieved 2009-06-11. ^ "PlayStation Store Update blog". 2009-09-10. Retrieved 2009-09-11. ^ a b c d Konami; Arcade machine manual for Teenage Mutant Ninja Turtles: Turtles in Time. ^ a b Allgame review of Teenage Mutant Ninja Turtles: Turtles in Time. URL retrieved 30 October 2006. ^ a b Instruction manual for Teenage Mutant Ninja Turtles IV: Turtles in Time. ^ a b c d e "X-Cult comparison of Teenage Mutant Ninja Turtles: Turtles in Time and Teenage Mutant Ninja Turtles IV: Turtles in Time". 2008. Retrieved Jan 23, 2010. Previous version accessed Sept. 16, 2006. ^ NinjaTurtles.com episode synopsis for "Heroes in a Half-Shell, Part 5 – Shredder and Splintered". URL retrieved 16 July 2006. ^ NinjaTurtles.com episode synopsis for "Krangenstien Lives". URL retrieved 16 July 2006. ^ NinjaTurtles.com episode synopsis for "Divide and Conquer". URL retrieved 16 July 2006. 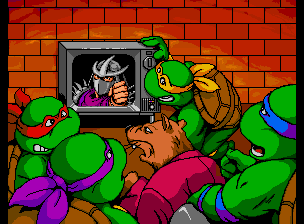 ^ a b c Allgame review of Teenage Mutant Ninja Turtles IV: Turtles in Time. URL retrieved 15 August 2014. ^ IMDb review of Teenage Mutant Ninja Turtles: Turtles in Time. URL retrieved 22 July 2006. ^ Moby Games profile of Harumi Ueko. URL retrieved 22 October 2006. ^ Moby Games profile of Kazuhiko Uehara. URL retrieved 22 October 2006. ^ a b Arcade History review of Teenage Mutant Ninja Turtles: Turtles in Time. URL retrieved 22 July 2006. ^ Game Music Revolution CD information for Konami All-Stars 1993 ~ Music Station of Dreams. URL retrieved 13 October 2006. ^ Video Game Talk review of Teenage Mutant Ninja Turtles 3: Mutant Nightmare. URL retrieved 15 October 2006. ^ "Video – WARROCK M1". GameTrailers. 2011-05-25. Retrieved 2013-08-17. ^ "Turtles in Time – Super Nintendo – Mean Machines review". Meanmachinesmag.co.uk. Retrieved 2013-08-17. ^ Nintendo Power Magazine review of Teenage Mutant Ninja Turtles IV: Turtles in Time. Issue of 1 August 1992. ^ a b Nintendojo review of Teenage Mutant Ninja Turtles IV: Turtles in Time. URL retrieved 16 July 2006. ^ "Developer Lookback: Konami Part I". Retro Gamer (Imagine Publishing) (53): 29. August 2008. ^ a b The Armchair Empire review of Teenage Mutant Ninja Turtles: Turtles in Time. URL retrieved 16 July 2006. ^ Nardozzi, Dale (2009-08-03). "Teenage Mutant Ninja Turtles: Turtles In Time Re-Shelled Review (Xbox 360)". Team Xbox. Retrieved 2009-08-08. ^ a b Nicholson, Brad (2009-08-11). "Review: TMNT: Turtles in Time Re-Shelled". Destructoid. Retrieved 2010-12-02. This page was last modified on 2 December 2014 at 17:22.